The Independent reports Spanish police storm Catalan government buildings to stop independence referendum. As MishTalk’s Mike Shedlock details, the Catalan president described the raids as a “co-ordinated police assault” and a “de facto state of emergency”. Spanish national police have stormed ministries and buildings belonging to Catalonia’s regional government to put a stop to the region’s independence referendum. In the early hours of the morning armed officers arrived at various Catalan ministries, including the economy department, foreign affairs department, and social affairs department, Spanish media reports. At least twelve Catalan officials are said to have been arrested, including the chief aide to Catalonia’s deputy prime minister, Josep Maria Jové. The arrests come as the mayors of Catalan towns who back the referendum were yesterday questioned by state prosecutors. Pro-independence crowds have formed outside the regional ministries in support of the provincial government and in protest against the raids and searches. Speaking at lunchtime Carles Puigdemont, the president of the Catalonian government, said the Spanish government had “de facto suspended” home rule in the province. The tactics of prime minister Mariano Rajoy have not won him any popularity contests. The Spanish national assembly on Wednesday rejected a motion to support the Spanish government’s heavy-handed response to the the referendum by 166 votes against to 158 in favor, after the centre-left opposition party PSOE teamed up with left-wingers Podemos and smaller separatist parties in the parliament. After news of the raids broke on Wednesday, separatist political parties, as well as Podemos, cancelled all their planned political events for the rest of the day. “It is unacceptable for there to be political prisoners in a European democracy. The Partido Popular leads us to an authoritarian regression that cannot be tolerated,” a spokesperson for Podemos said on social media. The Guardian reports Catalan president says Madrid is suspending region’s autonomy. The Catalan president has accused the Spanish government of effectively suspending the region’s autonomy and declaring a de facto state of emergency. Police officers raided Catalan government offices on Wednesday and arrested 12 senior officials in a bid to stop an independence referendum being held in less than two weeks’ time. Carles Puigdemont described the raids as a “a co-ordinated police assault” that showed that Madrid “has de facto suspended self-government and applied a de facto state of emergency” in Catalonia. 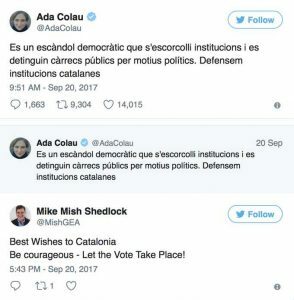 Mayor Colau is against independence but she does want to allow the vote. 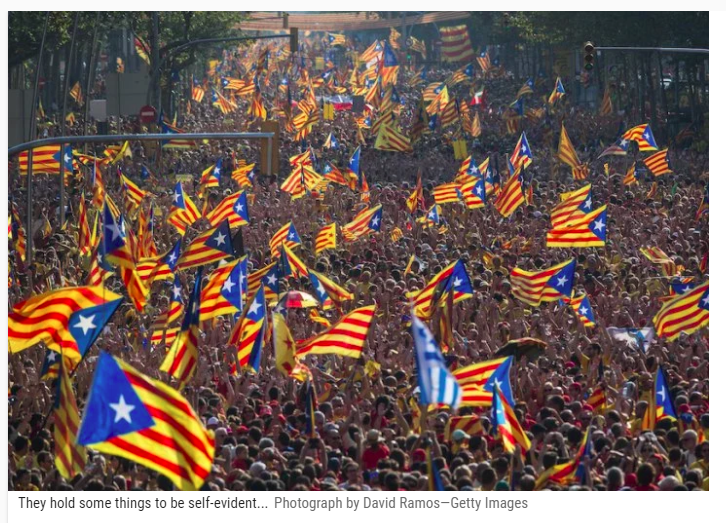 What if Britain treated Scotland the way Spain treats Catalonia? UK MP Daniel Hannon hits the nail on the head with his Telegraph piece on Europhiles. Imagine that, instead of agreeing terms with Alex Salmond on an independence referendum, David Cameron had prosecuted him. Suppose Tory MPs had called for troops to be deployed to prevent a vote, and for Scots to be Anglicised. Scottish voters would have felt, with justice, that they were being treated as conquered vassals and the United Kingdom would have cracked apart. Incredibly, Spanish conservatives are taking this line on Catalonia. For many on the Spanish Right, hostility to separatism is the core of their beliefs. They justify their inflexibility by pointing to the letter of the constitution, which forbids such plebiscites, but their motive is more atavistic than legalistic. Paradoxically, they are creating the very thing they purport to oppose. You persuade people to stay by making clear they are free to leave. Rajoy’s tactics have done nothing but drum up support for independence. In Catalonia’s case, the regional government says that Madrid shortchanged it by somewhere in the range of €11 billion to €15 billion in 2011 (between €1,500 and €2,000 per capita), depending on how one does the calculations. The central government countered by saying the gap was only €8.5 billion. By the Spanish government’s own admission, Catalonia is shortchanged. Those are 2011 numbers, from a 2015 article in Fortune, but I have seen nothing more recent. A September 2017 BBC article, referenced below, mentions the same numbers. The above snip from the BBC report Catalonia’s Collision Course with Madrid. I support that view. More importantly, so do 700 mayors in the region. Which leaves us with the simple question – as the Spanish government attempts to ‘save’ the Catalan people from ‘themselves’ – Should Catalonia be independent? As The Mises Institute’s Jeff Deist explains, surely Catalans, and nobody else, must answer that question. Some Catalans consider themselves Spanish and some don’t. Many Spaniards consider Catalonia part of Spain, while some don’t. But it’s clear that a significant number of Catalans feel politically conquered, and resent it. Why should they live under a Spanish government, when their history, culture, and language are not Spanish? Certainly many Hillary Clinton voters in the United States feel this way today. They don’t consider Trump a legitimate president (even aside from the electoral college issue), and are not particularly interested in respecting election results or the views of Trump voters. They feel “their” government not only does not represent them, but is actively hostile toward them. They feel, in short, like many Catalans. Understanding any region’s local politics and history is always a dangerous proposition for outsiders. Catalonia has a messy and complex past, dating back to the late 15th century and the nascent Kingdom of Spain. Momentum for independence from Madrid gathered throughout the 20th century, culminating in a 2014 referendum which the Spanish central government attempted to block in court. Over 80% of voters supported independence, yet only about a third of Catalans participated in the vote. It is unclear whether a scheduled October 1st vote on a new referendum will happen, given the possibility of Spanish criminal charges against the Catalan politicians behind it. Should Secession Be Allowed for Groups We Disagree With? There are also very serious questions about what an independent Catalonia would mean, not only for economically wobbly Spain but also neighboring France and the EU. Marta Hidalgo, a Spanish financial adviser and 2017 Mises University graduate, argues that Catalonia is Spain. She questions the region’s historical claims to independence, arguing that Catalan nationalism has been fraught with propaganda from those seeking to make a political movement out of a minority sentiment. She also points out that Spain is Catalonia’s principal market, propping up the Catalan economy through duties and tariffs on (otherwise) cheaper and better imports from England or Germany. And she stresses polls showing only about 2 million out of 7.5 million Catalans support secession. But these arguments don’t address the fundamental underlying issue of self-determination. Should Catalans be allowed to make their own decisions, even if those decisions are “bad,” and we (or Spain or the EU) disagree with them? Yes, some people would be worse off under an independent Catalan state — assuming Ms. Hidalgo is correct. But by the same token, some Spaniards may be objectively better off as a result of becoming unyoked politically from Catalonia. It’s a complex factual question, and both sides have arguments. But whether an independent Catalonia would be better off or worse off is highly subjective, and simply not for us to decide. For libertarians, self-determination is the highest political end. In political terms, self-determination is liberty. In an ideal world, self-determination extends all the way to the individual, who enjoys complete political sovereignty over his or her life. The often misued term for this degree of complete self-determination is anarchy. In an imperfect world, however, libertarians should support smaller and more decentralized governments as a pragmatic step toward greater liberty. Our goal should be to devolve political power whenever possible, making states less powerful and easier to avoid. Barcelona is less ominous than Madrid. The Legislature in a US state is less fearsome than Congress in Washington DC. Street gangs are bad, but they can be avoided in ways Uncle Sam cannot. Some … libertarians claimed that we should oppose the referendum on the grounds that it would create a new government, and thus two states would exist in the place of one. But reducing the size and scope of any single state’s dominion is healthy for liberty, because it leads us closer to the ultimate goal of self-determination at the individual level, to granting each of us sovereignty over our lives. It’s always good to reduce the number of individuals over which any government asserts authority. So let Catalonia go, if it chooses.